Tiddlywinks meets, during term time, on a Friday morning in the Parish Room from 9.30am – 11am. There is a small charge per child to cover costs and refreshments. 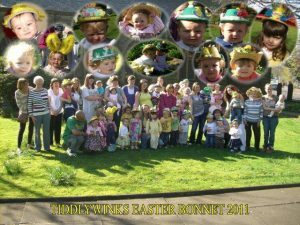 The Tiddlywinks Group welcomes all pre-school children and their carers, and seeks to offer a safe environment for play and interaction for the children, and an opportunity for the grown ups to relax and chat. We meet every Sunday morning during term time to teach children aged 3-14 about Jesus and what it means to follow him. 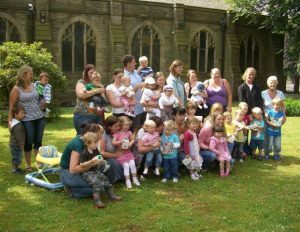 An enthusiastic team of volunteer leaders provide a safe and fun environment for the younger children to discover the wonder of God’s love for them, plus a varied programme for the older children to grow in faith and help prepare them for the adult world. The Community Group meets every other Tuesday afternoon in the Parish Room from 1pm to 3pm and looks at how we can relate more effectively to the community around us. There is no requirement to be a church member. The programme includes talks, games, trips out and other varied activities to promote fellowship and companionship with one another. The choir practise on a regular basis, usually on a Thursday evening at 7.00pm, in preparation for Sunday and other special services. New members are always welcome. We have a group of workers carrying out maintenance and improvements to the fabric of the church. The aim is to maintain the church in a presentable manner and to make it welcoming, safe and accessible to all visitors. We have been working towards giving disabled people their rights of access to everyday services (including church services) that others take for granted. Much of the work is routine maintenance, which is carried out by members of the congregation, mainly on regular workdays. Over recent years we have been successful in raising funds for new lighting in the main body of the church, a new music system and a loop system. In December 2008 we had a new ceiling installed in the Parish Room and we also redecorated the room. 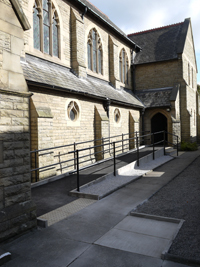 We completed, in August 2009, the installation of a permanent disabled ramp. In 2011 we completed the re-roofing of the Parish Room extension. 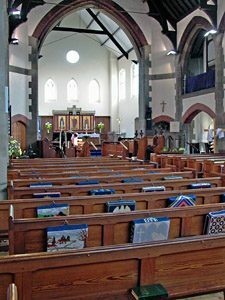 Subsequently we have refurbished and replaced defective guttering around the church, plus repairs to the Parish Room roof and tile replacements. Two ageing gas boilers serving the Extension and the Parish Room have been replaced with one new energy efficient boiler. 2015 has seen substantial work carried out to the West Wall and Window. This was made possible by the obtaining of grants from various bodies, including the Diocese, and the many generous donations from our congregation and friends. This work was necessary to maintain the fabric of the Church, so that it may continue to provide a valuable service to the community of Hopwood, not only for religious purposes, but also for use by various groups in and around the Parish. The Church has, in 2016, decorated and re-carpeted the Church and improved the flooring and seating in the Parish Room. In 2017 the Church installed new LED lighting in the main body of the Church, much improving the quality, whilst reducing the running costs. The uniformed organisations meet at the Scout Hut on Manchester Road, Hopwood. There are vacancies for those wishing to be group leaders, but volunteers for other activities are also welcome. Beaver Scouts First Colony – for age group 6 to 8 years, meet on a Monday evenings from 6.00pm to 7.00pm. 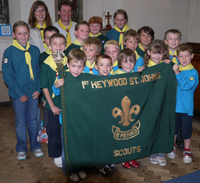 Cubs – Meet on Monday evenings from 7.00pm to 8.30pm. Beaver Scouts Second Colony – Meet on Tuesday evenings from 6.00pm to 7.00pm. Scouts – for age groups 10 1/2 to 14, meet on a Tuesday evening from 7.15pm to 8.45pm and welcomes boys and girls for a varied programme of activities. Rainbows – Meet on Wednesday evenings from 5.50pm. Cubs – Meet on Wednesday evenings from 7.00pm. Explorer Scouts – Meet on Thursday evenings from 7.15pm. We set up a Walking Group early in 2010, which has proved to be very popular. The walks are not strenuous and we usually meet on the fourth Wednesday of each month, starting from St. John’s at 10.00am. We have done a couple of canal walks, Jumbles reservoir, Ramsbottom to Irwell Vale and back, are examples. The walk generally includes refreshments at a local cafe or tearoom. Anyone is welcome to join in, whether they come to church or not. This venture started in September 2011. 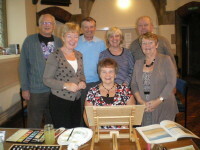 It is community based for those who have an interest in painting and for those who may have lapsed and just need the encouragement of others to start again. It is not essential to be a member of the church. The Group meet every Monday afternoon in the Parish Room from 1.00pm.